Welcome to a bit of paradise! Ideal location. You will have easy and beautiful access to Poipu Beach. You will also have a lovely private key-entry pool between the condo and the beach. Your view is panoramic-- lovely landscaping, palm trees, blue water through the palms, distant green ridges and mountains! This 2 bedroom, 2 1/2 bath townhome is 1800 square feet of elegance and beauty near the ocean and right on the expansive greenbelt in the privileged Manualoha section of the Resort at Poipu Kai . The interior has been remodeled to create a wonderfully light and open space for your family to enjoy. A uniquely elegant and comfortable environment. Please see our photos. Your light and airy home away from home, with full dining, kitchen and laundry conveniences. Fully equipped kitchen. High-end leather couches and large leather easy chair. Master suite features a custom bamboo king-size bed, walk-in closet, cable TV (flat screen) with DVD and VCR, private stereo system, and large covered lanai. The connected master bath includes glass block spa shower, tub, seated vanity area, and garden views. Equipment closet with bogie boards, beach chairs, beach umbrella, etc. Linen closet with plenty of beach towels, etc. The resort has spacious and lush tropical landscaped grounds and is one of Kauai’s lowest density resorts. Tennis courts (6), gated swimming pools (7), Jacuzzi spa, restaurant, and 24 hour security. No units above or below you contributes to the house-like relaxed environment. Watch the sunset through waving palm trees from the upper lanai. On VRBO's "location map" the unit is just above the "d" in the label "Hoone Rd"and to the left of th "P" in Pee Road. This is a better locator than the street address, which shows the entry/upper end of the private Manaualoha driveway and we are the last unit on the right of the lower/ocean end of the driveway. There is a lovely spacious grassy and landscaped open space in front, leading down to the private pool and beaches and across to the tennis facility. The gas grill is at the edge of the greenbelt about 30 feet from the lower lanai. It's really, truly an exceptionally beautiful location and environment. Those who know the area realize that it our unit very special-- we bought it after staying at many different units. It was by far the best combination of interior beauty and exterior location. As you can see from the many reviews, our guests have loved it. If you click on sort by reviews we are at or near the top for Poipu area rentals! We wish you a warm Aloha and a memorable stay. The Manualoha section of Poipu Kai is easily the most open and spacious resort/condominium development in the Poipu area, with ample grass and lovely landscaping with bougainvillea, plumeria and other lovely tropical flowers. Our building has exceptionally broad exposures of grass and lovely landscaping leading to the nearby beach. It is unlike any other condominium development we have seen on Kauai, with its truly lovely plantings, finely maintained grounds and with seven tennis courts and ample swimming facilities. Golf nearby. 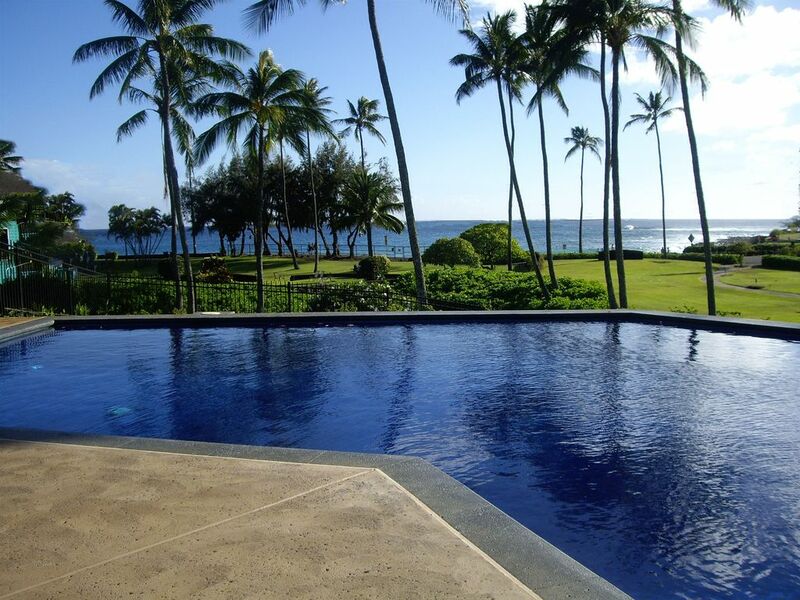 A few steps to the sparkling private pool for Manualoha residents and only a few more steps to the beach. We often stop off at the Manualoha pool after snorkeling at the beach-- a quick fresh water shower a dip, and a rest in a chaise lounge overlooking the beach. Then on to the condo, where the gas grill is conveniently outside the lower lanai and local fish and meats are ideal for grilling! condominium! 2.5. Master bathroom has walk-in shower with rain shower (horizontal and vertical), hand-held and wall nozzles, as well as a separate bathtub, two sinks, vanity and seating area. Poipu Beach has been rated as one of the 10 best in America. Several different areas--great for all ages! Muliple tennis courts and swimming pools; lovely landscaping, our unit is very close to the beach; walking path through landscaped grounds to Hyatt Hotel and Spa. The only thing between you and the beach are palm trees. A lovely landscaped greenbelt path leads to the ocean and it is actually less than 200 steps from the unit to the beach! Ample supply of linens along with pool and beach towels. Side by side with water and ice dispenser. Ample high quality flatware, serving utiensils, dishes, glasses, and trays. Top of the Line Appliances in gourmet kitchen. Open views of the ocean and tropical grounds make preparing meals here a very enjoyable experience. Side-by-Side Refrigerator, Glass Cook Top, Cookware, Coffee Grinder, Espresso Machine, Coffee Machine, Blender, Vegetable Steamer, etc. Flat screen TVs in great room and master bedroom. Also DVD and CD library for guest use. Sound bar for improved fidelity. Varied library includes Kauai guidebooks and trail guides. CDs are in almost every music genre. Private stereo system in master suite. DVDs, but bring what you like for best enjoyment. Surfboard rentals at Brennecke's beach; Kayak rentals and trips on Wailua River and other locations. Should be boogie board(s), folding beach chairs and beach toys in the equipment closet. Also badmiinton and tennis racquets, other items. 6 courts. Small daily fee. (2) View of beach and ocean from Manualoha pool is spectacular! In main pool about 100 yards from unit. High speed cable internet, Cable TVs, Great room has flat screen TV, DVD CD player and VCR, Master Suite has flat screen TV, DVD/VCR and Private Stereo System, Video/ DVD/CD/Audio Tape/Book/Game Library, Outdoor & Indoor Eating areas, Phones in every room, Answering Machine, Linens, Beach Towels / Chairs and Umbrellas, Hair Dryers, Lighted Mirrors, Top of the Line Appliances, 2 Ovens, Side-by-Side Refrigerator, Glass Cook Top, Cookware, Coffee Grinder, Espresso Machine, Blender, Steamer, Food Processor, Outdoor Gas BBQ, Restaurant on Premises and many others close by. We had a wonderful stay at this Poipu condo. The beautiful beach was a short trip down the grassy walkway and we enjoyed late afternoon swims in the pool. The condominium was well appointment with an excellent kitchen and breathtaking views. The property was an easy walk to Poipu Beach. We loved the lanai which had a great view of the ocean. The layout of the condo worked great for our family of 4. We would definitely recommend to friends and family if they are looking for a great spot near the beach in Kauai. looking for a pleasant vacation. Many thanks for your nice review. We are delighted you were pleased. Aloha Sands is a quaint and comfortable condo - close to the beach. We really enjoyed it! A few draw backs are that the pools are not heated and there’s only 1 spa heated to about 90 degrees. The beach was great and close. Overall a relaxing holiday at Aloha Sands. Thank you, Ashley. I needed pools are not usually a problem on the Hawaiian islands, but this has been an extraordinarily cold winter. Hopefully, the rest of the year will be more nearly normal. I wonder if the word “quaint“ was intended to be “quiet,“ since the unit is very much updated (see pictures). Many thanks! We agree with everything you say. We absolutely loved our stay here.... so peaceful and rejuvenating...can’t imagine a more restful stay. Watch the sunset through waving palms from the upper lanai! 7 top-notch tennis courts at Manualoha. Golf (2 championship courses) nearby, Fitness Center and full service Spa at the Hyatt Regency (easy walk), restaurants in walking distance, more within a 5 minute drive or less, Botanical gardens, Catamaran Trips, ATV Adventures, River kayaking, Historic Koloa Town, Helicopter rides, Ultra-light flights, Sky-diving and more, Drive to both ends of the island road within an hour and half from this central location. Smoking is not allowed. Cancellation policy is 60 days, except during holiday season, per rental agreement.